Like most "adult" bands found in towns and cities across the United States, the Salisbury Community Band exists to share a rich musical heritage with the residents of the immediate area as well as being a viable medium for band musicians to exercise their cumulative talents. And like many, they do so in a bandstand that is historic (1930s), one that has undergone at least two renovations with the most recent being completed prior to the 2004 summer concert season. We are fortunate to have a regional community that cares enough to perpetuate the edifice and what it stands for. While many communities throughout the country have felt the same way - to see just a few examples, look at our pictorial collection of other bandstands across the country - many more have been unable or unwilling to do the same. Also you may be interested in the following book: Lest We Forget: Band Stands of Maine, an Illustrated History by Barbara Merrill Fox. Published by Foxrun Associates, Bar Harbor, ME, ISBN 0-9741671-0-X. There is some historical reference to a cornet band in Salisbury years ago, but the formative years of the band as we know it today began around 1937 with the formation of the Salisbury Municipal Band. The Lions Club and other businesses and organizations assisted in this process as well as the band's first conductor, H. B. Marston, former solo clarinetist with John Philip Sousa. The Board of Education assimilated the band in 1939 as the Wicomico High School Boys' Band but soon dropped the gender tag as girls quickly became part of the membership. Mr. Marston soon became an employee of the school system and the band began playing weekly concerts in the bandstand for most of the summer as well as many civic engagements. Upon Mr. Marston's retirement in 1946, Michael Ronca became director for a short while. He was followed by Andrew Jupina who maintained the mission of the community band at that time. However, while the band had basically remained a student group for its summer activities, post-WWII veterans who were alumni of the school band as well as other adults gradually began to change the membership ratio to more like what it is today. The name change to Salisbury Community Concert Band probably occurred around this time with the word "Concert" eventually being dropped. Mr. Jupina retired after 10 years with the band and was replaced by Wallace Duyer in 1956, the fourth individual to hold the dual role of director of both the Wicomico High School Band and the Salisbury Community Band. Mr. Duyer transferred to the new James M. Bennett Junior High School in 1962 and became the county's first elementary band instructor one year later, however he continued as the Community Band's director until 1973. In 1962, Frank G. Reinhardt became the first manager of the band and he served in that capacity until his death in 1978. Due to his diligence and willingness to resist a political decision that nearly caused the demise of the band, he was instrumental in perpetuating the tradition of band concerts in the park and if not for him, even the bandstand may have gone the way of some of those alluded to above. Accordingly, the bandstand was officially named in his honor in 1979 with a granite monument that is now situated behind the brick memory wall. It is up to all of us to "keep his dream a reality". In 1963, Charles F. Smith, Jr. replaced Mr. Duyer as band director at James M. Bennett High School after it existed just one year as a junior high school. Simultaneously, he joined the Community Band as a percussionist and spent the next ten years in that capacity. Upon Mr. Duyer's retirement in 1973, Mr. Smith assumed the directorship of the Salisbury Community Band. A year prior, he had joined the Music Department of Salisbury State College as Director of Bands. He eventually applied for sabbatical leave to complete a doctoral residency at the University of Maryland for the 1978, '79 and '80 summer concert seasons, so trumpeter Larry Harrison, also band director at Laurel, DE High School became the sixth director of the Community Band. After Mr. Reinhardt's death, Jean Wootten, former Supervisor of Music in Wicomico County became the Manager. During the summer of 1981, Tom Zimmerman, who had replaced Mrs. Wootten as Supervisor of Music in Wicomico County became Manager of the Community Band, a post he held until 1995. Simultaneously, the summer of 1981 saw Mr. Smith return to the band as its director, where he remained as director until his retirement in 2011. The summer of 2012 saw, for the first time, a Music Director and Assistant Music Director positions. Todd Riddleberger, a regular performer, guest soloist, and guest conductor with the Band since his arrival in Salisbury in 1998, took the position of the Music Director and Howard Snow, member of the band since 1970, accepted the Assistant Music Director position. The mission of the Salisbury Community Band since its inception has basically remained the same - present band music to members of the community in a manner which mirrors traditions of the past especially when your stage is a historical icon in that community. As expressed in the Welcome section of this website, the band performs five concerts each summer on the upper level of the bandstand (or nearby staging area when under renovation) or an alternate site in case of inclement weather. Demographics, resort area hiring needs, time, and other factors have decreased the number of concerts historically presented each season as well as contributing to an adult-dominated membership. However, student membership has always been encouraged for qualified upper level secondary school students from local and regional schools. About 30% of the 100 band members who participated in at least one concert during the summer of 2005 were high school students. Their participation speaks well for the future of this organization. Several times each year, the band performs in association with local or regional civic, government, private, or other organizations. Special concerts in the past include selection as one of the Community Bands to perform at the 1985 Association of Concert Bands Convention in Norfolk, VA under the direction of Dr. Charles F. Smith, Jr. Just a year earlier, the Salisbury State College Band and the Salisbury Community Band joined forces due to insufficient instrumentation in both groups. They performed at the convention as the Salisbury State College and Community Band and stressed that such an arrangement might be feasible for other such groups with similar concerns. A year later, they again had a special performance featuring Dr. Smith as "John Philip Sousa" conducting a traditional Sousa concert. Upon his retirement from what is now Salisbury University in 1988, this arrangement between the two groups ceased even though several adults continue to perform with the university band. 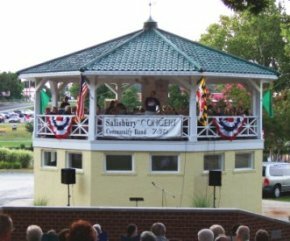 Many years later, May 18, 2003, the Community Band did its part to help raise funds for the community/regional goal to restore the termite/infested bandstand with a concert in Salisbury University's Holloway Hall Auditorium. The most recent celebration was held at our final concert of the 2005 summer season. Jim Collins played the baritone in the Wicomico High School Band prior to WWII and was one of the alumni who joined the Community Band after his defense of our country. Starting with director H. B. Marston, he has been a faithful member for each succeeding director, a total of 60+ years. He was recognized for his long service and until he says otherwise, he is expected to join us again in 2006. Can you ask for any higher inspiration in causing each of us to do our part to perpetuate what we are all about?